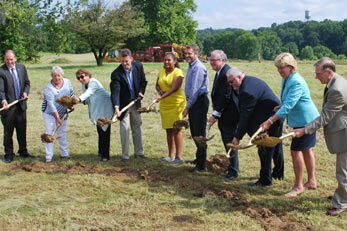 Westminster, MD, Thursday, July 26, 2018 – The Carroll County Board of Commissioners joined the Warfield Companies’ partners, members of the Carroll County Delegation and town officials in the Town of Sykesville today to celebrate the official groundbreaking at Warfield at Historic Sykesville. As onlookers viewed the ceremony on the property, bulldozers moved in the background to prepare for the first phase of the project – the construction of 145 townhomes by Elm Street Development. 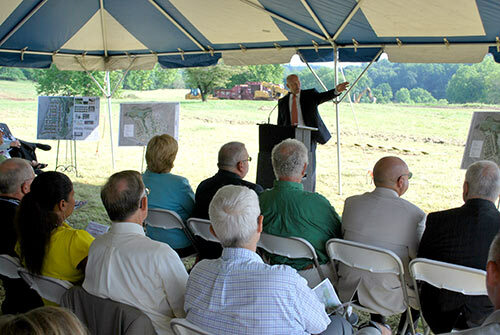 Featured speakers mentioned the Warfield project’s long history with the State of Maryland, Carroll County Government, the Town of Sykesville, the Industrial Development Authority, the Warfield Companies and many private companies working together to envision, plan and complete the deal that led to the groundbreaking ceremony. Lee & Associates is already marketing the available commercial space and the partners plan to renovate the remaining historic buildings to restore them to their former glory. The project also includes three parcels for new commercial development. The ceremony is be available on the county YouTube channel, the county Facebook page, and re-broadcast on Comcast Channel 24.